Participants : Jérome Béchu, Fabien Bénureau, Haylee Fogg, Paul Fudal, Hugo Gimbert, Matthieu Lapeyre, Olivier Ly, Olivier Mangin, Pierre Rouanet, Pierre-Yves Oudeyer. In the context of its participation to the exhibition “Mathematics: A Beautiful Elsewhere” at Fondation Cartier pour l'Art Contemporain in Paris, starting from 19th October 2011 and to be held until 18th March 2012, the team has elaborated and experimented a robotic experimental set-up called “Ergo-Robots/FLOWERS Fields”. This set-up is not only a way to share our scientific investigations with the general public, but attacks a very important technological challenge impacting the science of developmental robotics: How to design a robot learning experiment that can run continuously and autonomously for several months? Indeed, developmental robotics takes life-long learning and development as one of its central objective and object of study, and thus shall require experimental setups that allow robots to run, learn and develop for extended periods of time. Yet, in practice, this has not been possible so far due to the unavailability of platforms adapted at the same time to learning, exploration, easy and versatile reconfiguration, and extended time of experimentation. Most experiments so far in the field have a duration ranging from a few minutes to a few hours. This is an important obstacle for the progress of developmental robotics, which would need experimental set-ups capable of running for several months. This is exactly the challenge explored by the Ergo-Robots installation, which we have approached by using new generations of affordable yet sophisticated and powerful off-the-shelf servomotors (RX Series from Robotis) combined with an adequately designed software and hardware architecture, as well as processes for streamlined maintainance. The experiment is now running for five months, six days a week, in a public exhibition which has strong constraints over periods of functionning and no continual presence of dedicated technicians/engineers on site. 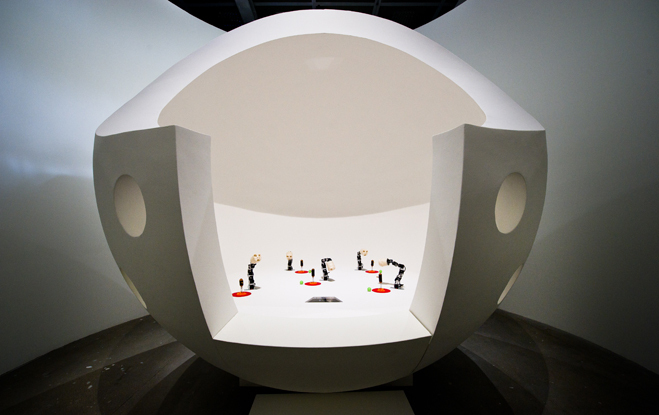 The experiment involveds five robots, each with 6 degrees of freedoms, which are endowed with curiosity-driven learning mechanisms allowing them to explore and learn how to manipulate physical objects around them as well as to discover and explore vocal interactions with humans/the visitors. The robots are also playing language games allowing them to invent their own linguistic conventions. A battery of measures has been set up in order to study the evolution of the platform, with the aim of using the results (to be described in an article) as a reference for building future robot learning experiments on extended periods of time, both within the team and in the developmental robotics community. More information available at: http://flowers.inria.fr/ergo-robots.php and http://fondation.cartier.com/ . Figure 15. Installation of Ergo Robots at Foundation Cartier.